The RomeHello is a place for everyone. All you culture queens and craft beer buffs. All you tattoo artists and selfie snappers. All you graffiti writers and table football champs. All you history teachers and skater dudes. Basically, it's a place for you. With an artistic layout, friendly staff and super funky activities, The RomeHello aims to offer an experience not just a bed to crash. 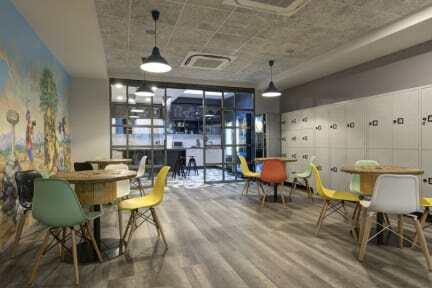 Want to meet a mix of culture, reserve a bed in one of our larger en-suite dorms! Each bunk has an individual lamp, USB chargers, plug sockets and a personal shelf. Looking for something smaller, reserve a bed in our smaller dorms! Twin, double and triple en-suite private rooms... fully equipped. Central location: Strut here straight from Rome's central station. We have a 24 hours reception, a kitchen a lounge, a pub and a beer garden! Breakfast not included - 7 EUR per person per day. Special conditions apply for groups. Super séjour, très bien placé, personnel impliqué et qui prend le temps de nous renseigner, plus petit atelier d'initiation aux gestes utilisés par les italiens, vraiment superbe auberge de jeunesse, un vrai plus d'avoir la salle de bain privée dans la chambre, grand confort ducoup ! Best hostel I've been in my life!!!! More clean than a lot of normal Hotel. Auberge au top (très récente, décorée avec goût) Rien a dire, le prix paraît peu élevé par rapport aux services et à la qualité des prestations (très propre, cuisine très fonctionnelle, supermarché juste à côté) Le personnel est top, a l’écoute Possibilité de prendre des cours de yoga lundi/mardi (gratuitement!) Allez y les yeux fermés !! J’en ai déjà fait des hostelworlds mais alors que celui la reste le meilleur de toutes. Belle emplacement, très très propre, moderne, super confortable et une équipe attentionnée et très dynamique. Une belle expérience pour terminer nos belles séjours à Roma. Je dirai « à bientôt », car on compte bien d’y retourner un jour. It was a beautiful and rentable stay. People are nice, helpful and funny. Talking many languages. The room was nice, modern and super clean. It was absolutely wonderful. The location very easy to find and nearby every commodities. Will go back to the same hotel next time and suggest it to everybody. Enjoy!!! Localisation parfaite, auberge exceptionnellement propre, installations modernes et qui répondent à tous nos besoins, personnel très sympathique et aidant. Seul commentaire constructif : il serait intéressant que le petit déjeuner au bistro de l’auberge soit inclus dans les frais de la chambre. Merci pour l’agréable séjour! A really good place to stay in Rome ! Nothing bad to say about this place. My friend and I were in a room for women, and everything was perfect. I highly suggest eating in the bar/restaurant “The Barrel” the food is not really Italian, but it is very good. 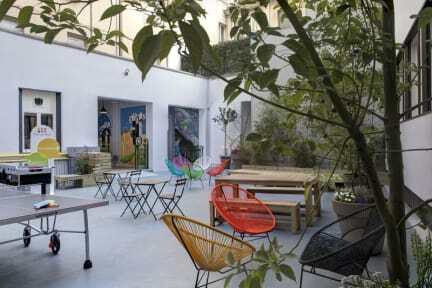 If one day I’ll come back to Rome, I’ll certainly take this hostel again. Excellent hostel! Clean, big room, good common space. The only thing that we could regret is that breakfast is not included. If you want one, it's 7 euros, which is a bit expensive. But it seems good though. I hadn't tried it. But definitely, it's a very good hostel to stay.